Tell me if you’ve heard this before: the Golden State Warriors and the Cleveland Cavaliers are meeting in the NBA Finals. That’s right. 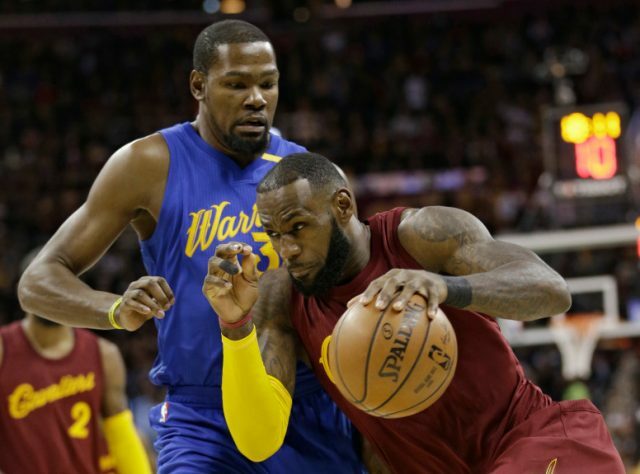 For the fourth year in a row, the tumultuous, grueling NBA regular season and the even more arduous NBA Playoffs have culminated in these two teams matching up. Although both teams had to overcome more adversity to get here than they’ve been accustomed to (Cleveland had two playoff series reach a Game 7, Golden State had 1), their collective reign over the rest of the league continues. Many fans, league executives, and even players have lamented this seemingly inescapable rivalry and its effects on the NBA as a whole. But how valid are their concerns? For starters, the 2017-18 NBA regular season’s combined viewership in the U.S. was up 8 percent from last year and was the highest total since the 2013-14 season. Similarly, these past NBA Playoffs had the highest-rated opening Saturday in five years. At first glance, it appears the Cavs-Warriors saga has not hurt the NBA’s popularity, but perhaps even improved it. But there are many other factors at play here. Going into the season, it appeared the rest of the league was beginning to catch up to these two teams. Kyrie Irving demanded a trade out of Cleveland and was shipped to the Boston Celtics where he joined forces with fellow All-Star Gordon Hayward, coaching mastermind Brad Stevens, and a host of young talent. Out West, Chris Paul was traded from the Los Angeles Clippers to the Houston Rockets and formed an explosive backcourt duo with James Harden. The Oklahoma City Thunder did their best to create a “super-team” of their own, bringing in Paul George and Carmelo Anthony to complement Russell Westbrook. The Toronto Raptors looked primed for a breakout year. So did Giannis Antetokounmpo and the Milwaukee Bucks. On top of that, several dark-horse teams emerged during the course of the season, including the Philadelphia 76ers, Indiana Pacers, Utah Jazz, and New Orleans Pelicans. Fans were tired of seeing the same teams competing for a championship, and several franchises took advantage of the opportunity to put together a team that could realistically compete now. As a result, the league appeared to be, and in many cases was, more competitive this year than in recent years. That higher level of competition played the biggest role in increasing viewership and ratings both for the regular season and the playoffs. And we can expect similar outcomes in the coming years. The middle or top tier teams will continue adding whatever talent they can to try and knock off either of these two powerhouses. Meanwhile, the teams at the bottom will build up through the draft in hopes of becoming formidable opponents within the next few years. So while the NBA may be predictable now, Golden State and Cleveland are setting the stage for a much more competitive league for years to come. This may even be the final time they play each other for a championship. Paul Davenport is a rising senior at Loyola University Chicago (yes, the home of Sister Jean and the NCAA Final Four Ramblers) studying psychology and sport management. He has coached elementary and junior high school basketball and has played many sports himself, including basketball, baseball, soccer, volleyball, track and field, and Quidditch. He hopes to someday run his own psychology private practice and perhaps specialize in sports psychology. Previous articleNightengale: MLB Renders Verdict on Heimlich, but is it a Life Sentence?